Researching her family history, Sigrid Falkenstein found her aunt’s name – Anna Lehnkering – on a list of 30,000 people who were murdered by the Nazis as part of the Aktion T4 project in the year 1940/1941. This spurred Sigrid on to find out more both about her Aunt and Aktion T4, the Nazi programme for sterilising and murdering those with mental or physical disabilities. Who, if not us, would be the most appropriate to give you back your identity and name, and therefore some of your dignity? Sigrid used family photographs and memories alongside archives to reconstruct Anna’s life story to ensure that she lives on even after she was murdered as a victim of Nazi Persecution. Anna was born in the Ruhr Area of Germany on 2 August 1915 to Heinrich Friedrich Hermann Lehnkering and his wife Anna Johanna Helene. Anna had three brothers and the family ran a pub. When she was four years old Anna became very restless, had night time tremors and some nervous episodes. Family life took a turn for the worse. Life after World War One was hard, and Anna’s father turned to drink to drown his sorrows. He died in December 1921 of cirrhosis of the liver. In 1922 Anna’s mother married again and shortly afterwards she gave birth to a baby boy. Anna did not have an easy time at school and she often had to repeat the school year. One doctor described her as good natured and obedient. At the end of February 1929, a school report noted that Anna’s attendance was inconsistent because of illness and as a result her knowledge was inadequate. Anna loved playing with children and wanted to help in a nursery when she was older. She was a big help to her mother, cleaning, making the beds, and running errands. Anna was religious and enjoyed going to church, particularly as she met with other disabled girls, with whom she felt very comfortable. In 1931, two years after her schooling had ended, Anna went to a children’s institute for mentally disabled children. When Sigrid was researching more about Anna’s ill health, she discovered that there had been family rumours that her father’s dependence on alcohol was a possible cause of Anna’s nervousness. Sigrid wondered whether Anna herself was aware of this and how it might have affected her relationship with her father. Sigrid’s father also recalled that Anna was dropped by a neighbour when she was a baby and that may have contributed to her illness. Anna's disability was not identified in any of the files that Sigrid found but for Sigrid, the cause of Anna’s illness was not important; she was more concerned with finding out about Anna’s life and why her family had kept silent about Anna. In December 1934, age 19 Anna was called before a court to determine if she should be sterilised. Her mother accompanied her and the court decided that Anna should be sterilised. 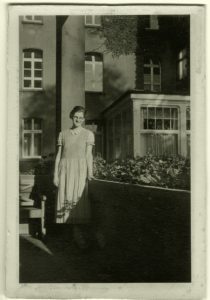 Sigrid believes that Anna did not know what was going to happen to her; there is a photo of Anna standing in front of the hospital where she was forcibly sterilised, and she is smiling. One and a half years after being sterilised, Anna was admitted to hospital suffering from kidney disease. The doctor persuaded Anna’s mother that she needed to be institutionalised as they would be able to offer the care that Anna needed. In December 1936 Anna was taken to a so-called healing and care home. Anna underwent further diagnoses and tests of her intelligence, with mathematical questions as well as general knowledge. Despite not being able to build a picture of day to day life in the home, Sigrid’s research demonstrated that those in the care home were mistreated and often starved. While researching, Sigrid was informed that Anna died on 23 April 1940; not only was this the incorrect date, but the word ‘died’ belittles the fact that Anna was murdered. Anna was 24 years old when she was transported, along with 300 women and 157 men to Grafeneck Euthanasia Centre, in southern Germany. It is estimated that 10,654 mentally and physically disabled people were murdered in gas chambers at Grafeneck in 1940. Grafeneck was one of six centres, and it is estimated that at least 250,000 disabled people were murdered under the Nazi regime. Anna’s mother received a letter to say that Anna died of peritonitis – an inflammation of the tissue lining the stomach – on 23 April. Sigrid’s research led her to believe that Anna was murdered on the day she arrived in Grafeneck, 7 March. Sigrid hoped Anna did not suspect what was going to happen to her, and therefore her last hours were not full of fear and panic. Sigrid compiled her research into a series of letters to Anna, restoring the identity that the Nazis tried to take from her. These letters form a book about Anna, integrating her life story into a wider historical context, creating an exemplary family history. This book, together with Sigrid’s website and a Stolperstein, memorial stone, ensures that Anna is not forgotten, and that she still lives on today. This resource has been produced with support and help from Sigrid Falkenstein for which we are very grateful. Helen Melanie Lebel was also murdered by the Nazis in the T4 programme. Read her life story here.